Ever since green monster smoothies became a thing a few years ago, they solidified the top spot in my breakfast routine. As a busy, on-the-go, working mom who happens to be a vegetarian, it can be a serious challenge to get a wholesome, impactful breakfast in first thing in the morning. Smoothies are an easy way to pack a ton of protein and your daily dose of nutrient rich super foods into one cup. Being off work recovering from total hip replacement surgery means the pace of daily life has slowed down significantly and the importance of checking all the nutritional guideline boxes has increased exponentially. Food is fuel and fuelling your body with quality nutrition will not only help you live your best life, it will help aid in your recovery process. Life in the slow lane means that I now have time to sit back and really enjoy my first meal of the day. 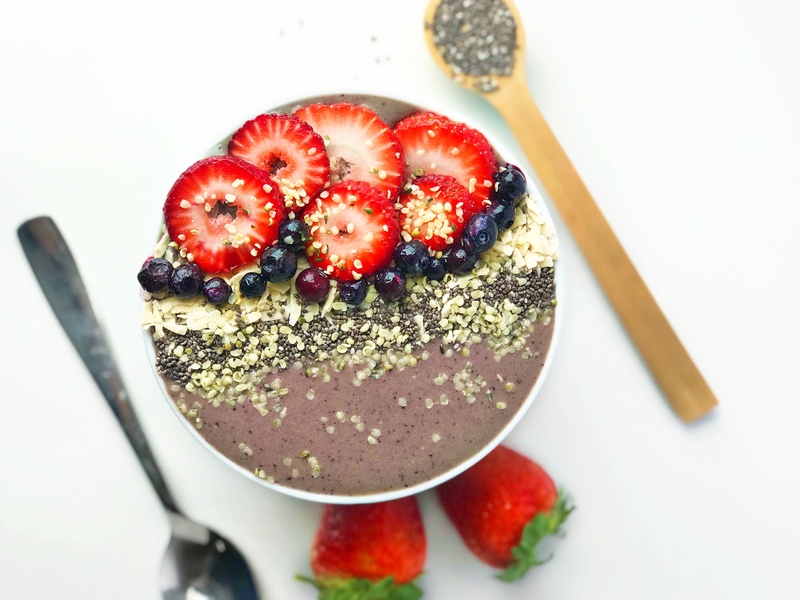 Made with less liquid that traditional smoothies, this thick and creamy smoothie bowl checks many nutritional boxes. Versatile and delicious, and Instagram worthy to boot! On the go? No problem! Throw all the ingredients into a blender, pour into a cup and you’re on your way! What’s your favourite smoothie bowl ingredient? Pro Tip: Using frozen fruit makes for a creamier, thicker and obviously colder smoothie, this also eliminates the need for ice! No time for a smoothie bowl? Throw all ingredients into a blender and blend until smooth. Pour smoothie into a cup and enjoy!